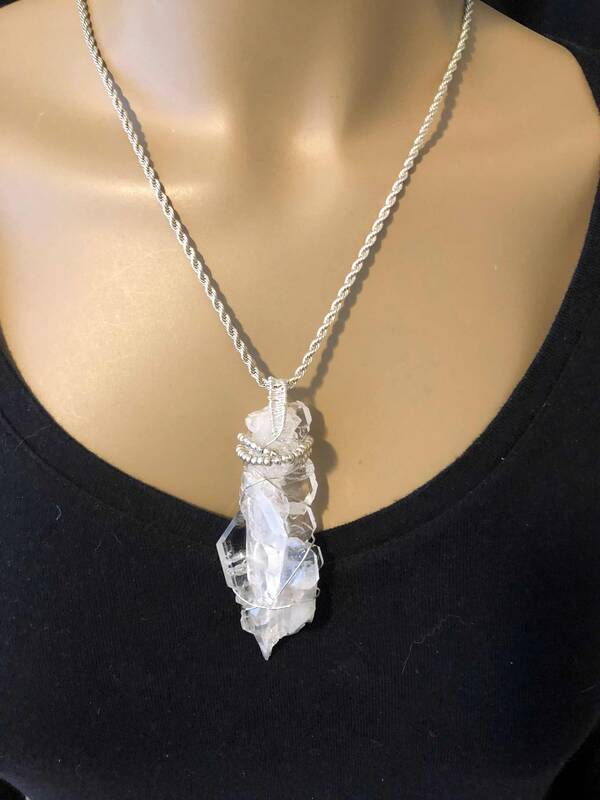 This is a gorgeous piece of Faden Quarts that I wrapped with sterling. It is hanging on a stainless stell chain that will never tarnish. The crystal measures, including the bail, 3.5 x 1.25. The chain is 22". The word Faden is from the German language, meaning thread. Though most dealers say these crystals originate in Pakistan, they more often than not come from Afghanistan, or right on the Afghanistan/Pakistan border. I guess to some dealers it sounds more politically palatable that way. As these crystals play a very important role in this contentious region, there is no room for the head-in-the-sand approach! Though the line running through these crystals could be viewed by some as being divisive or a sign of duality, it is more an indication of the symmetry of life in this amazing universe. In human terms this can be taken as we are all one people and all linked, yet are individuals contributing to a collective consciousness. This family of individual crystals is also linked together. 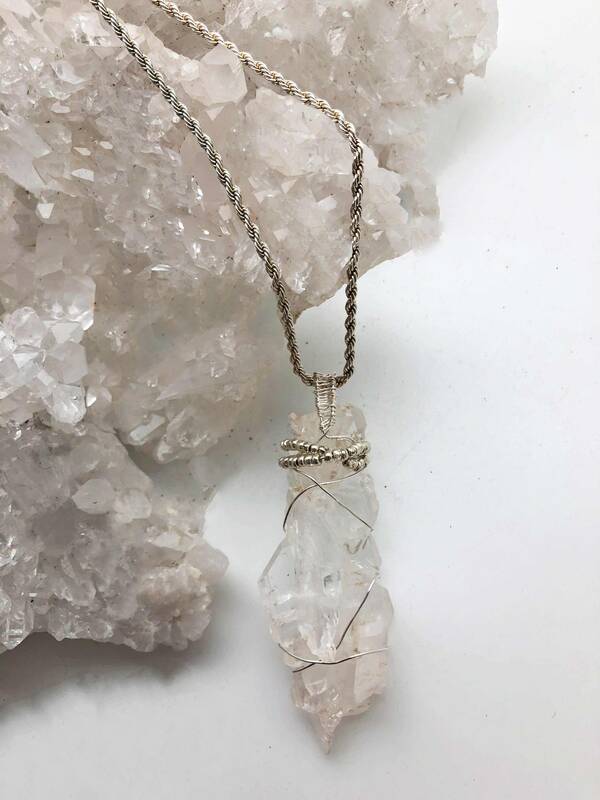 Should one choose to work with these beautiful crystals in a harmonious and positive matter, that positive energy and intent will be channeled directly back to all of the Faden crystals. This will have the effect of raising the consciousness in a much needed way for this long troubled region. As Faden Quartz crystals are easily programmed, this is easy to do. Just hold one in your hands and think/feel any or all of the following: synergy, balance, communication, self healing, connection, unity, love, white light. Then put the crystal in a safe place, and it’s done! In my humble opinion, it is much more enlightening to become part of the solution for the woes of humankind than merely being a concerned spectator! These crystals are very good for working on oneself as well. 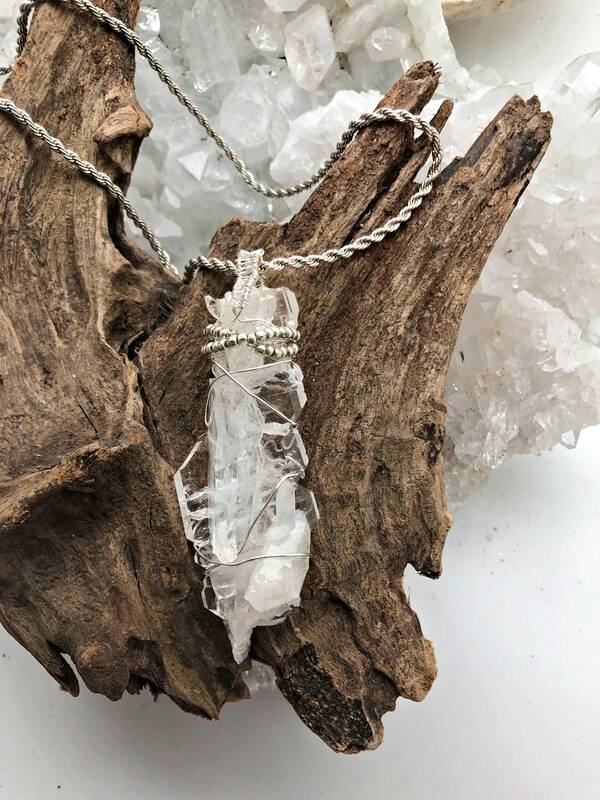 Faden Quartz Crystals are Master Self Healing crystals!